The New York Post issued a scathing rebuke of Rep. Ilhan Omar (D-MN) with their Thursday cover and editorial after Omar described the September 11, 2001, Islamic terror attacks that killed thousands of Americans as "some people did something." Omar made the remarks, which sparked widespread outrage, during a March 23 speech at an event for the Council on American-Islamic Relations (CAIR) — which the United Arab Emirates has designated as a terrorist organization. Omar has since bemoaned criticism of her from Fox News and Rep. Dan Crenshaw (R-TX) in response to her remarks by alleging that they were engaging in "dangerous incitement" against her. The New York Post responded to Omar's comments by making the story the feature story in their Thursday publication with a cover photo of the World Trade Centers under attack on September 11, 2001, and with a headline that stated: "Here's your something"
The New York Post's cover for Thursday calls out Ilhan Omar for trivializing the 9/11 terrorist attacks as "some people did something"
"How pathetic: A member of Congress can’t acknowledge what happened on one of the most horrific days in US history," The New York Post Editorial Board wrote. "Some people did something? Wow. What a way to describe the heinous surprise attack on America that claimed 3,000 lives." At the March 23 event, Omar said: "CAIR was founded after 9/11 because they recognized that some people did something, and that all of us were starting to lose access to our civil liberties." The Post's Editorial Board noted that "CAIR wasn’t founded post-9/11, but in 1994. And the feds later named it an unindicted co-conspirator in a plot to steer US funds to the terror group Hamas." "Yet Omar upped the obscure-the-facts ante Wednesday, declaring criticism of her 'some people did something' line to be 'incitement,' on the grounds that she has received death threats," The Post's Editorial Board concluded. "Huh? She’d rightly be outraged if anyone minimized those threats as merely 'some words from some people.' 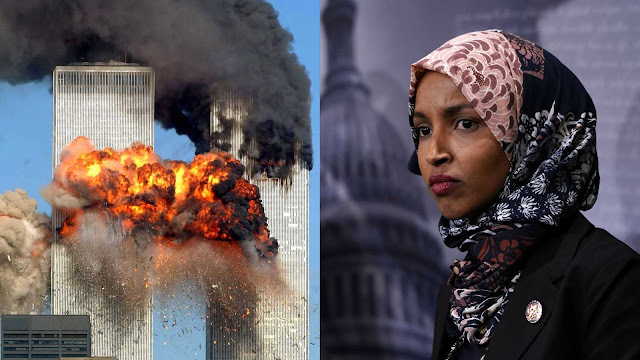 Omar’s cavalier brushing off of the murder of thousands of innocents on 9/11 should shock all Americans, Muslims included." "What Congresswoman Ilhan Omar said about Sept. 11 was disgraceful," Riches wrote. "She dismissed thousands of people being murdered like it was an everyday occurrence when she said 'some people did something.'" "We picked up the bodies and saw how gruesome it was," Riches wrote. "Those people died a horrible death. We were there for 9 months picking up body parts, pieces." "I think Omar owes an apology to America. She owes an apology to the families," Riches concluded. "She came here from Somalia. She was educated here. We took care of her. And now she’s saying 9/11 was nothing? Until the time that you realize the importance of 9/11 as the worst day in American history, I call for your removal from Congress." Earlier in the Week, Crenshaw called out Omar for her comments, tweeting: "First Member of Congress to ever describe terrorists who killed thousands of Americans on 9/11 as 'some people who did something'. Unbelievable." after 18+ years it has become painfully obvious to everyone who, like myself, has studied every aspect of 9/11, that the government/media 9/11 fairytale is just that, a fairytale. so is it omar who is trivializing the 9/11, or is it alt news site articles such as this which ignore the obvious; 9/11 was an inside job. Jim Riches should be prosecuted for actively covering up his own son's murder. Dimitri Khalezov exposed how it was done, yet the criminals still run the institution of government.